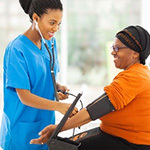 MONDAY, May 9, 2016 (HealthDay News) -- Instead of relying on individual blood pressure readings, doctors should review the overall pattern to predict a patient's risk of stroke or early death, new research suggests. "Our study suggests that looking at someone's blood pressure over time and whether it increases slowly or steeply may provide additional information above only the level of blood pressure at a certain time," said researcher Dr. Marileen Portegies. She is with the department of epidemiology at Erasmus University Medical Center in Rotterdam, the Netherlands. High blood pressure is the number one risk factor for stroke. But, most studies assessing risk have looked only at measurements taken at a single point in time, the researchers said in background notes. For this new study, Portegies and her colleagues collected 20 years of data on the systolic blood pressure (the top number in a blood pressure reading) of more than 6,700 Dutch adults. Participants were ages 55 to 106 and living in a suburb of Rotterdam. The trial started in 1990, and five follow-up medical exams were conducted over two decades. Those whose systolic blood pressure rose steeply from mid-life on and those whose high blood pressure dropped after age 65 had the highest risk of stroke or death from other blood pressure-related diseases up to age 80, the study found. Moderately high blood pressure was linked to the highest risk of stroke overall, but the lowest risk of death from heart attack, heart failure and kidney disease, the researchers said. This finding "further underlines the importance of treating people with a high blood pressure, even if it is only moderately elevated," Portegies said. People with normal blood pressure that gradually increased had the lowest risk of stroke and a low risk of death from other causes, the researchers found. Most common was a gradual increase in blood pressure from normal systolic blood pressure (120 mm Hg) in middle age to high (160 mm Hg). Normal blood pressure in middle age but a steep rise to very high (200 mm Hg). Moderately high blood pressure (140 mm Hg) in middle age that did not change much. High blood pressure (160 mm Hg) in middle age, which decreased after 65. This pattern was more frequent in men, and these patients were more likely than some others to take blood pressure medication. Over two decades, more than 1,000 study participants suffered a stroke. The paths that blood pressure took over time appeared to have a bearing on stroke and death from heart attack, heart failure, kidney disease and other diseases, Portegies said. Compared with people whose blood pressure increased gradually, people whose high blood pressure dropped after 65 had the highest risk of stroke (13.6 percent). Next in line were those whose blood pressure rose steeply (8 percent greater risk) and adults whose moderately high blood pressure stayed stable (a nearly 5 percent higher risk of stroke), the researchers found. "The highest risk of stroke and death was found in the class with a high mid-life blood pressure and the class that increased steeply in blood pressure," Portegies said. The report was published online May 9 in the journal Hypertension. Other doctors agreed the findings support the need for regular blood pressure checks. "This study shows the importance of routine blood pressure checks and treatment of high blood pressure at early ages to maintain normal, or only modestly elevated, blood pressure," said Dr. Andrew Rogove, medical director of stroke at Northwell Health Southside Hospital in Bay Shore, N.Y. However, because the study was done among a mostly white population, it should be replicated in other groups to be certain the findings hold true for all populations, Rogove said. Regardless, "control of high blood pressure starting at an early age and continued throughout one's lifetime is important," he said. Also, with age, your blood pressure can change dramatically, and should be checked regularly, the researchers noted.